Situation: in the district Domaine de Villeneuve, residential area. Access/parking: 1 x car park (roofed); 1 x parking on the estate. Estate (private use): approx. 850 m², closed plot (fence, hedge), lawn. Outdoor facilities(private use): terrace (partially roofed, sun-blind), further terrace, furnishing provided, 2 deck chairs, 3 sun loungers, transportable barbecue. Center Piriac-sur-Mer in approx. 4 km. Mesquer in approx. 3.5 km. La Turballe in approx. 7 km. Next shopping possibility (Mesquer) in approx. 3.5 km. Next supermarket (La Turballe) in approx. 7 km. Sea in approx. 400 m. Sandy beach in approx. 500 m.
detached house, 6 people, 4.5 room/s, 3 bedroom/s, 2 bathroom/s, approx. 120 m², 2 floor/s. Equipment: satellite TV; DVD; wireless USB modem (included); washing machine; electric heating; storage room (garage). Living room(ground floor): furniture suite, fireplace (only for decoration), exit to terrace. From the living room stairs to the gallery with sleeping facilities, see bedroom n° 4. Kitchen: open to the living room, exit to terrace. Kitchen/ cooking equipment: 4 gas rings, oven, microwave oven, dish-washer, combination fridge-freezer, coffee machine, water boiler, toaster. Bedroom 1(ground floor): queen-size bed, exit to terrace. Additional information: direct access to sanitary no 1. Sleeping accommodation 4(floor 1, roof pitch): sofa bed at the gallery to the living room. Sanitary 3(floor 1, roof pitch): shower, double washbasin. Important information: maximum occupancy: 6 adults and 1 child(ren) to 2 years. Local service charges Electricity according to consumption approx. € 0,18/​kWh. Final cleaning by tenants or against payment, € 80. Holiday resort tax. Linen/towels must be brought along. 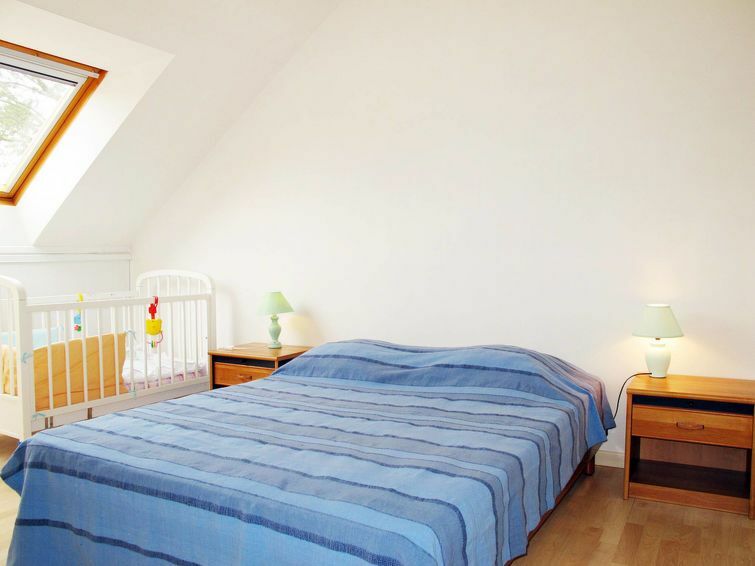 Bed linen available on loan, € 10 per person/​change (on order). Deposit € 300 (in cash). Cot free of charge (on order). Pet not allowed.